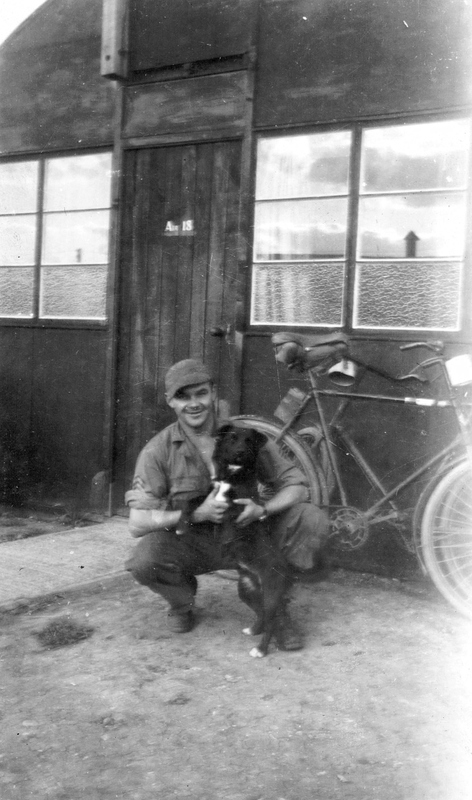 Delbert McNasty was not the only canine to grace the grounds of the Grafton Underwood airbase of the 384th Bomb Group with his presence. Many other dogs provided faithful companionship, joy, and comfort to the men of the group. 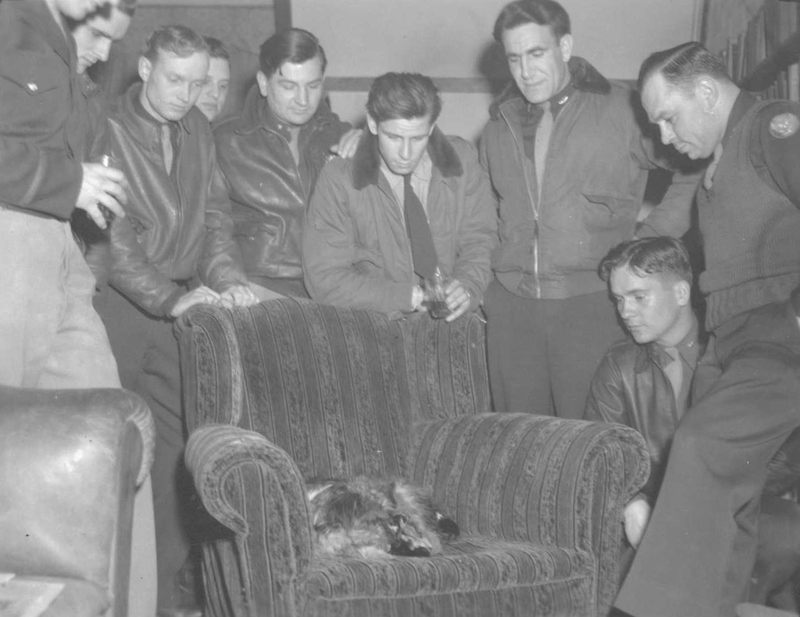 They all had to be good listeners as I suppose many airmen related the conquests and horrors of the day to their furry friends. These four-legged creatures greeted many men upon the return from their missions, and silently mourned those who didn’t come back. 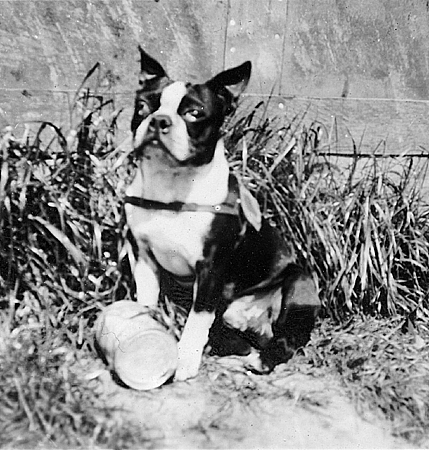 Assigned to the 544th BS; Salvo, mascot of the 544th BS, is the dog. The Alfred Sprague crew with Salvo. 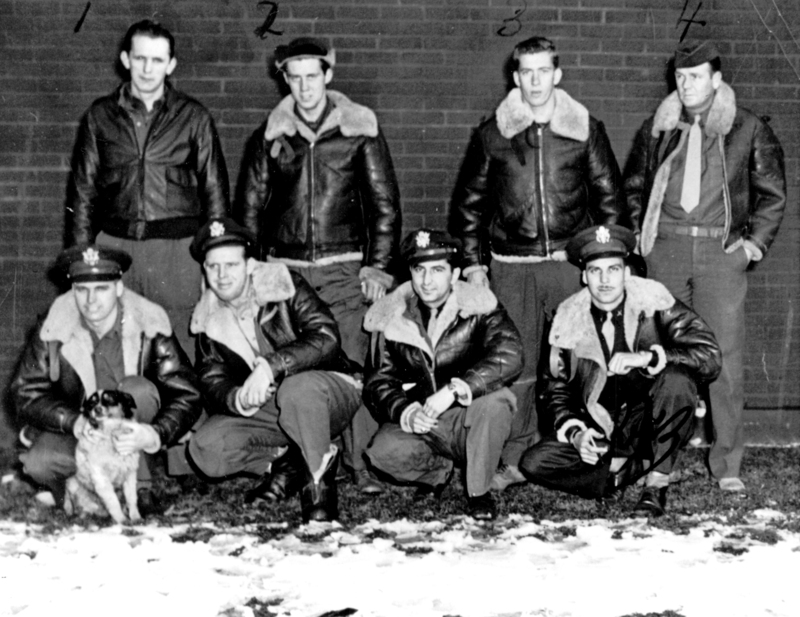 The Donald P. Ogilvie crew of the 547th Bomb Squadron is pictured below with a pup identified as Delbert McNasty and owned by tail gunner Ray Gregori, but he bears no resemblance to the Delbert McNasty in other photos. Back L-R: 2LT Robert B. Kilmer (CP), 1LT William H. Wilson (B), 1LT Barkley (N), 1LT Donald P. Ogilvie (P). Front L-R: SGT Francis R. Sylvia (WG), TSGT James Murray (RO), SSGT William E. Martin (WG), SSGT James W. McKeon (BT), TSGT Emmett A. 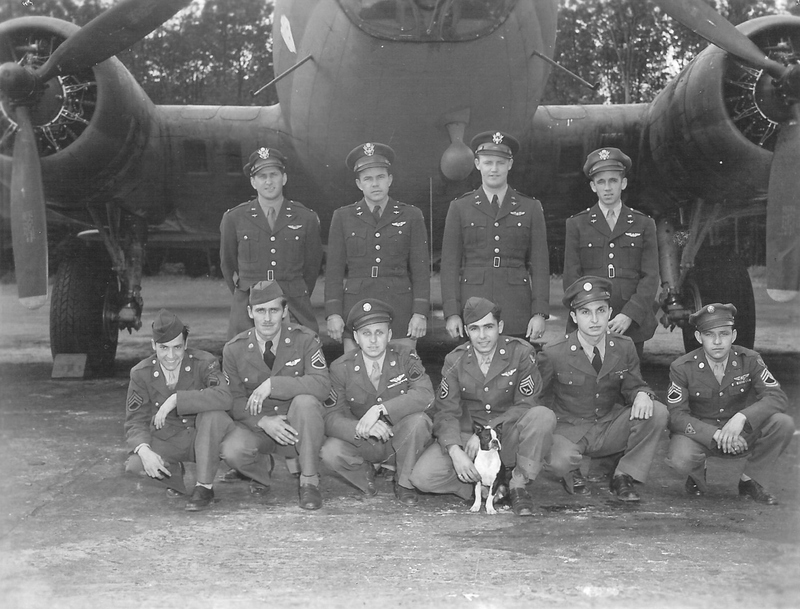 Hood (TT), SSGT Louis L. Ratkiewicz (TG). Donald P. Ogilvie crew with Delbert McNasty. This Delbert’s owner was reported to be tail gunner Ray Gregori. Back: Francis McKeon (TT), George Hart (BT), Landis Hartranft (TG), Thomas Long (TG). Front: Howard Cole (P), Horace Smigelsky (CP), Carl Leo Ganapini (see note) (N), Rexford Blackburn (B). Note: Carl Leo Ganapini is not listed in the 384th BG database, but is identified by one of Howard Cole’s bible pages. Cole may or may not have taken “Pilot” with him to Grafton Underwood. 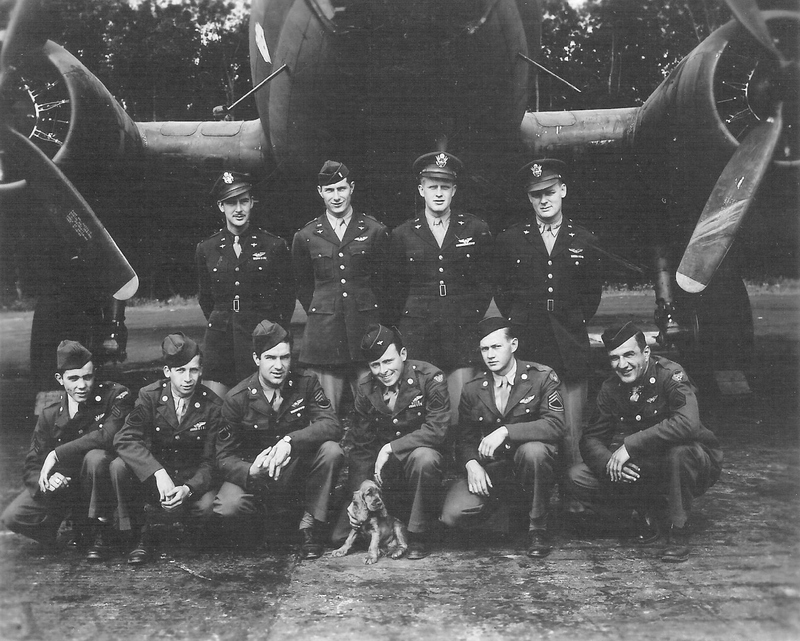 This is likely a training photo in the states as the Cole crew was assigned to the 384th without a navigator. Ganapini, the navigator in the photo, served with the 389th Bomb Group, a group flying B-24 Liberators from Hethel, England. Another 546th Bomb Squadron Ground Crew Chief, Bernerd C. Ollman, is pictured with Henry. 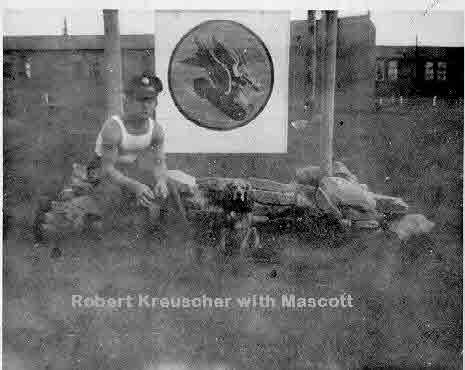 Photo from the Frank Priesnitz collection. So you thought photobombing was a new idea? 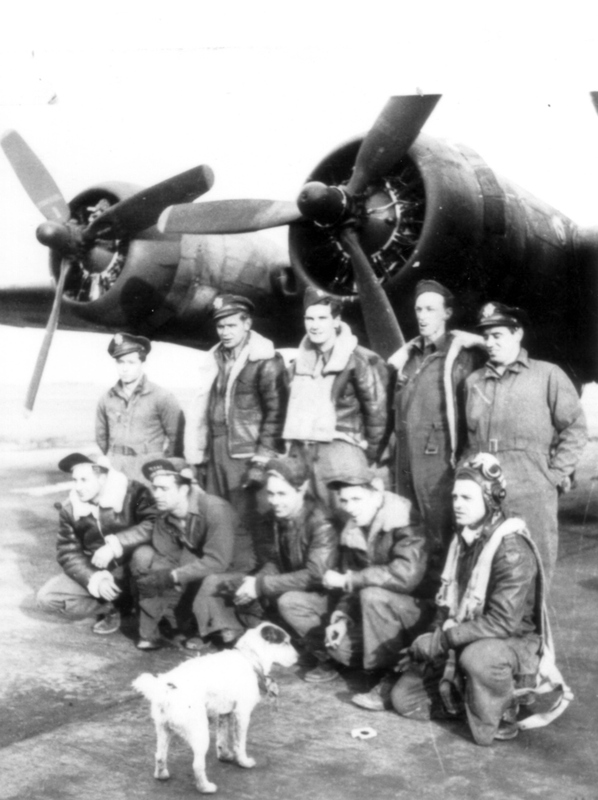 This unknown dog decided to photobomb this 384th Bomb Group crew of the Rum Pot II. The Rum Pot II failed to return from the April 14, 1944 mission to Schweinfurt, shot down by enemy aircraft. It was the High Group Lead that day. The right wing broke into a mass of flames and it crashed near Gumpen, Germany. The Commander, Joseph Bedsole, was killed and the remainder of the crew were taken prisoner. Note: the crew pictured is not identified. 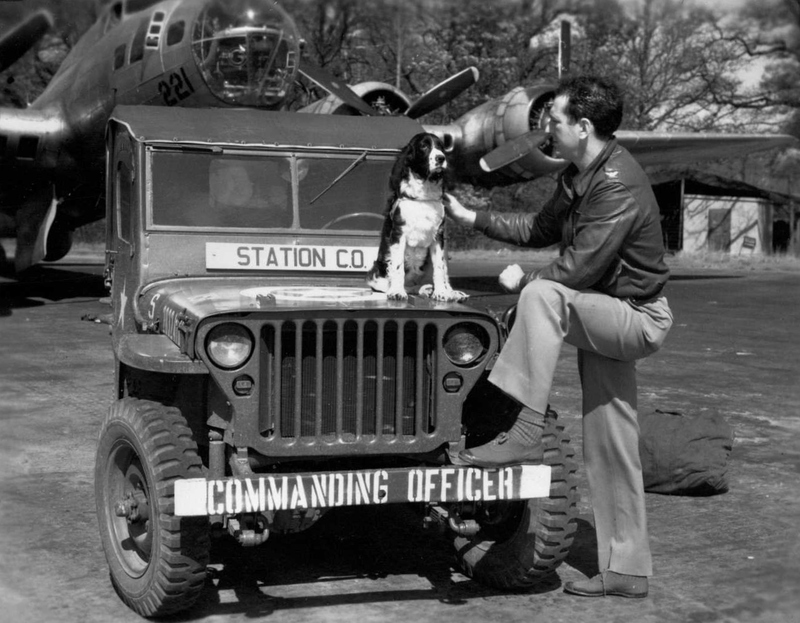 Fourth Commanding Officer of the 384th Bomb Group, Theodore R. Milton, is pictured with a dog perched on his jeep. Could this be a private strategy session with a trusted confidant? He’d never give away any top secret information. Ah, the miracle of life was a welcome distraction for these officers of the 384th Bomb Group when this dog gave birth to her puppies in their Officers’ Club. A reminder that life does go on even in the middle of a war. A dog gave birth to pups in Officers’ Club, May 5, 1944. By thearrowheadclub in 384th Bomb Group on March 29, 2017 .